So why are so many people saying that Czech glass is the ‘next big thing’? There are many reasons. If you look at the market for 1950s-70s Murano glass 10-15 years or so ago, prices were generally much lower than today and popularity was rising. I, and many others, believe that the market for Czech glass is at that point right now. If Czech glass moves in the same way over the next few years, big things could be on the horizon. Does this include all Czech glass, including 19thC and earlier Bohemian glass? It’s hard to say, but probably not as fashions have changed. 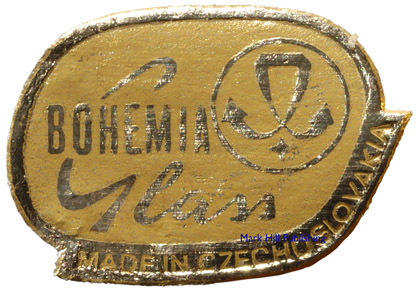 The area known today as the Czech Republic, and also known through history as ‘Bohemia’, has a centuries old tradition of producing fine quality glass. Although 19thC and earlier pieces may see a revival in popularity along with many traditional antiques, it’s unlikely they, or pieces from the first half of the 20thC, will see the dramatic rises that are predicted for postwar pieces. It’s primarily due to knowledge and exposure. Pieces made before WWII have been pretty well researched and understood for a while now. Those made from 1945 until the late 1980s, when the country was run by the Communist Soviet régime, are still being discovered and documented – there’s so much more research to be done. Until recently, the Iron Curtain prevented much research, and knowledge about the country’s enormous contribution to late 20thC glass design has been largely dormant. As well as developing their own visual language, many Czech artists and designers took inspiration from designs produced on Murano and in Scandinavia. 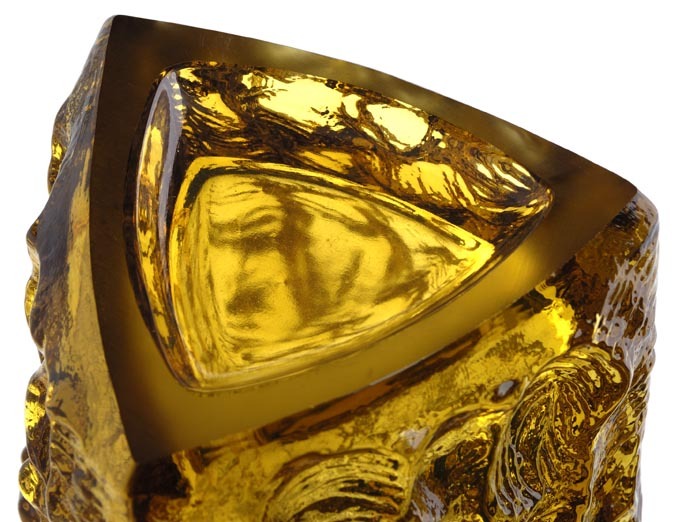 Abstract art, modern art, and an interest in optical properties of glass itself and the designs that can be made with it, were also strong influences. Some look like pieces made on Murano but also bear ‘cold-worked’ cutting, a technique that wasn’t common on Murano. 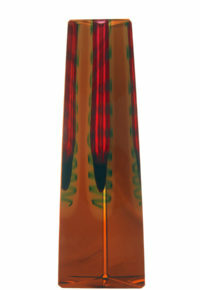 Colours can also vary – a typical colour combination is amber or brown and green – such as on the Skrdlovice vase designed by Jan Beranek below. Many shapes are also different and, once you ‘get your eye in’, are instantly recognizable as Czech. The best advice I can give is not to search the internet, as attributions can be incorrect – instead, invest in a good and reliably researched book, such as any of those listed at the end of this article, or buy from a reputable and knowledgeable dealer. I only have a small budget. What’s affordable? In general, the most affordable pieces are the pressed glass designs known to collectors today under the name ‘Sklo Union’. These designs were mass-produced by a group of factories that were united in 1965. It’s still possible to find examples, such as certain geometric designs by Vladislav Urban or Frantisek Vizner, in charity shops for a few pounds. Right now, it’s difficult to spend over £150 on a piece – even from specialist dealers. A good collection can be built up by spending under £50 per piece. Nobody yet knows quite how many of each design were made, but rarities are slowly being identified. At around £200, Adolf Matura’s notable ‘Head’ vases of 1974 are considerably rarer than the Vladislav Urban geometric example shown above. Some mould-blown, gilded pieces can also be found for under £50, but prices rise when the most visually impressive pieces are being sold by decorative dealers. Sklo is the Czech word for glass. Many collectors have now applied it to all types of glass produced in postwar Czechoslovakia, especially when selling on online auction sites like eBay. How do I tell the difference between cut and pressed glass? Good question. 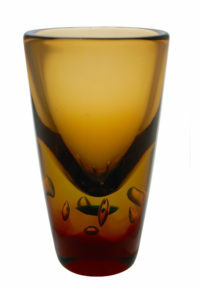 Pressed glass was often made to imitate more expensive cut glass. Edges will be more ‘rounded’ and less sharp when you run your hand over them. Look closely at the design and you may spot two or more straight, vertical lines hidden in the design, or else they may be more obvious. These are mould lines, left after the molten glass flowed slightly into the gaps between the separate parts that make up a mould. Pressed glass is ‘nearly never’ signed by hand, but may bear a raised or impressed name, country or patent or registration number – although I can’t think of an instance where this feature was used on postwar Czech glass. I’ve heard that Sklo Union pressed glass has a particular type of base, is this correct? Yes it does, and it’s often known as a ‘birdbath’ base as it has a smooth concave centre surrounded by a machine-cut rim (see left). However, pressed glass produced in other countries such as Poland also has a similar base, so always rely on shapes, patterns, forms, and even colours used, in the first instance. There’s a signature on a piece I own – what does that mean? Postwar Czech glass is rarely signed. If it’s a cut piece, a signature is a good sign as it usually indicates that the piece was cut by the designer, or under his or her direct supervision. If it’s on something hot-worked or freeblown, it could be a very good sign as it may be a unique piece made in the same way. However, you need to be careful as many factory-produced pieces made from the 1980s onwards were inscribed with the designer’s name, even though he had nothing to do with the production of that piece. It’s difficult to say what will happen to the values of these more modern pieces in the future. Right now, I’d stick with period production as there’s plenty out there still to find. 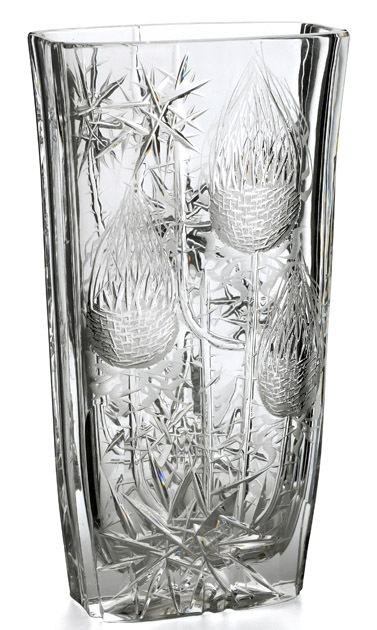 Most glass exported bore a ‘Bohemia Glass’ label (a 1950s-60s version below) that didn’t identify the designer or factory. This was partly due to the fact that the Communist regime didn’t see the importance of the individual, even if they were the designer. Do you have any tips for buying wisely? Yes! I’ve always done very well by setting an evening aside to search online auction sites like eBay or Etsy. But in order to do that you need to build up knowledge. I’d recommend that you get out there and handle as many properly authenticated pieces as possible. There’s also the potential for new discoveries. Even seasoned glass specialists don’t know everything, as this area is still exciting ‘frontier’ stuff. If you can develop a feel for the colours, shapes, designs, and type and quality of glass used, you may be able to spot a bargain – even at a specialist fair. Who are the major artists? There were many artists and designers working at the time. However, perhaps around 30-40 of them are currently considered interesting and important. That may change in future as more research is undertaken. Stanislav Libensky is an undoubted and influential master, but most of his unique masterpieces have already been snapped up by museums and major private collectors. It’s the same for many artists and designers at his high level. I’d advise looking at a second tier of artists and designers, who produced designs for mass-production and subsequent export, as it’s these that you’re more likely to find and be able to build a worthwhile collection around. So, whose work should I look for? There are plenty of top names to look out for. First up has to be Frantisek Vizner, who produced pricey unique masterpieces for the last few decades of his life. 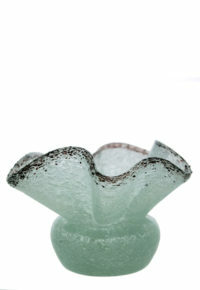 But he was also responsible for many designs in hot-worked and pressed glass. 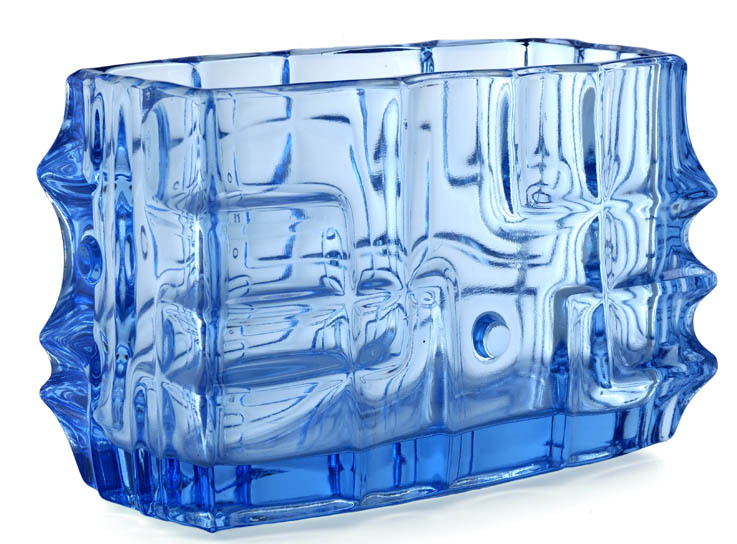 His importance to the story of postwar Czech glass is key. Josef Hospodka is another, as is Jan Gabrhel – both were prolific and talented designers. But I’d also recommend looking out for pieces by Frantisek Zemek. His ‘Rhapsody’ and ‘Harmony’ ranges are beautiful and are currently rising in value. Pieces by Miloslav Klinger, Milan Metelak and – for the future – Jiri Suhajek are also worth considering if you like them. In cut glass, other than Vladimir Zahour’s designs, I really rate the work of Josef Svarc whose designs inspired by nature (left) are not only complex and skilful, but also have immense dynamism. 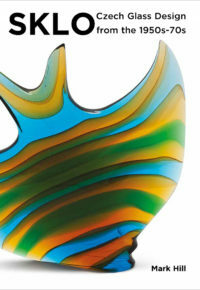 Hi Sklo Lo Sklo: Post War Czech Glass Design From Masterpiece to Mass-Produced, by Mark Hill, Mark Hill Publishing Ltd, 2008. Sklo Union: Art Before Industry – 20thC Czech Pressed Glass, by Marcus Newhall, Hope Fountain Books, 2008. Czech Glass 1945-1980: Design In An Age of Adversity, edited by Helmut Ricke, Arnoldsche, 2005. 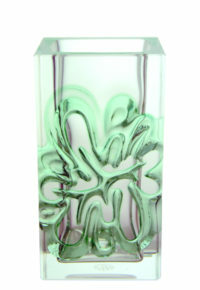 Bohemian Glass, by Frantisek Arnost, Olga Drahatova and Antonin Langhamer, Crystalex, 1985.